Have you ever dreamed of what life was like during the Elizabethan era? Have you ever longed to meet Shakespeare and see original performances of classic plays such as Hamlet and Romeo and Juliet? Twelve-year-old Jeanine Motha did more than just dream. She turned her knowledge and dreams into a book. Jeanine’s debut novel, The Break Away Sisters, tells the compelling and familiar story of writers struggling to make their work known to the world. The twist, however, is that those writers are two middle-class girls struggling during the late 1500s, a time when it was only socially acceptable for upper-class men to be authors. Throughout this short but compelling story, the reader is forced to remain in great suspense as protagonist sisters Mary and Anastasia face rejection and ridicule for daring to go against the societal norms and write a poem. Again and again, they try to share their poem with the world, but their neighbours disdain them for aspiring too high, and jealous upper-class writers stop at nothing to make sure that no one reads the sisters’ writing. One well-known author even lies about the girls to ensure they will never succeed. With a little help from a kind and lonely old gentleman, Mary and Anastasia come up with a plan to clear their name, reveal the true liar, and give their poem the chance it deserves. The big question remains, however. Will people ever accept Mary and Anastasia’s writing, or will the sisters be disgraced for the rest of their lives? 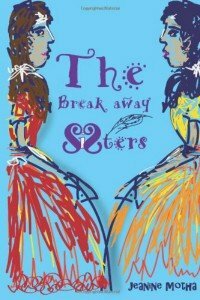 Follow the determined sisters’ adventures, find out how the story ends, and support fellow junior author, Jeanine Motha, by buying The Break Away Sisters on Amazon. thats a great summary jeanine congrats on publishing it hope u sucess all the way. So totally wanna read this!!! !